, one of our most distinguished naval heroes, who flourished in the reign of Elizabeth, was the son of Edmund Drake, a sailor, and born near Tavistock, in Devonshire, in 1545, but some have said that he was the son of a clergyman. He was, however, brought up at the expence, and under the care, of sir John Hawkins, who was his kinsman; and at the age of eighteen was purser of a ship trading to Biscay. At twenty he made a voyage to Guinea; and at twenty-two had the honour to be made captain of the Judith. In that capacity he was in the harbour of St. John de Ulloa, in the gulph of Mexico, where he behaved most gallantly in the glorious actions under sir John Hawkins, and returned with him to England with great reputation, though as poor as he set out. Upon this he projected a design against the Spaniards in the West Indies, which he no sooner announced, than he had volunteers enough ready to | accorapany him. In 1570 he made his first expedition with two ships; and the next year with one only, in which he returned safe, if not with such advantages as he expected. He made another expedition in 1572, did the Spaniards some mischief, and gained considerable booties. 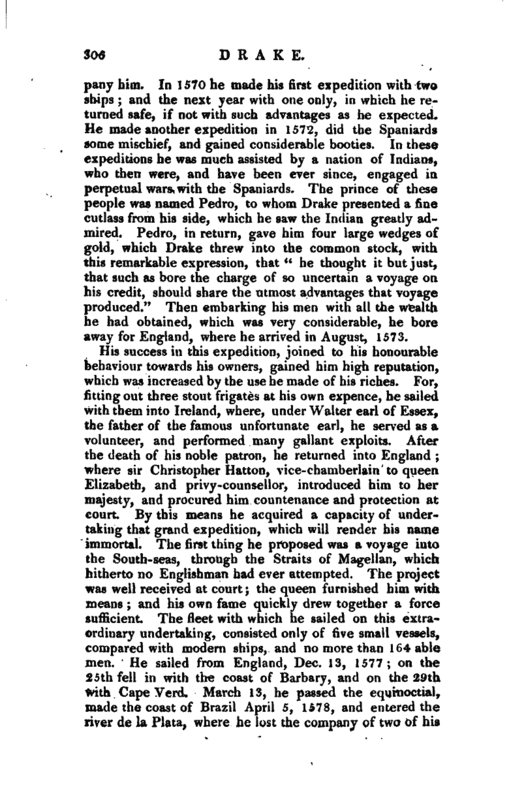 In these expeditions he was much assisted by a nation of Indians, who then were, and have been ever since, engaged in perpetual wars with the Spaniards. The prince of these people was named Pedro, to whom Drake presented a fine cutlass from his side, which he saw the Indian greatly admired. 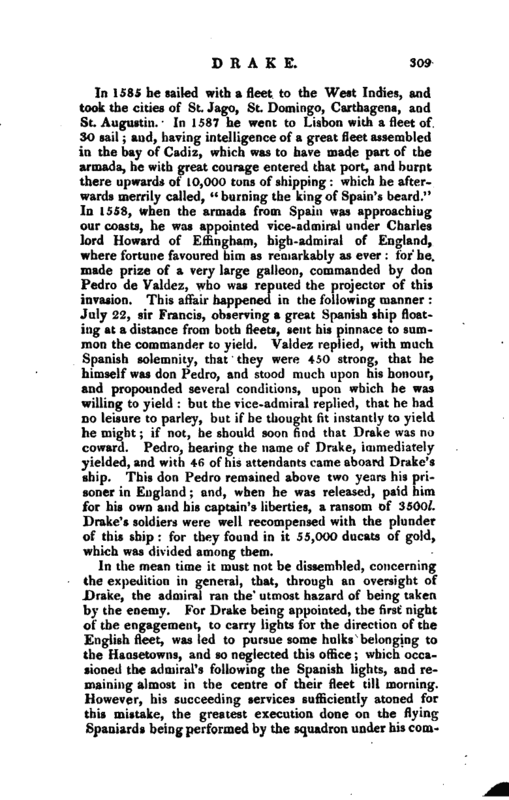 Pedro, in return, gave him four large wedges of gold, which Drake threw into the common stock, with this remarkable expression, that“he thought it but just, that such as bore the charge of so uncertain a voyage on his credit, should share the utmost advantages that voyage produced.” Then embarking his men with all the wealth he had obtained, which was very considerable, he bore away for England, where he arrived in August, 1573. His success in this expedition, joined to his honourable behaviour towards his owners, gained him high reputation, which was increased by the use he made of his riches. For, fitting out three stout frigates at his own expence, he sailed with them into Ireland, where, under Walter earl of Essex, the father of the famous unfortunate earl, he served as a volunteer, and performed many gallant exploits. After the death of his noble patron, he returned into England; where sir Christopher Hatton, vice-chamberlain to queen Elizabeth, and privy-counsellor, introduced him to her majesty, and procured him countenance and protection at court. By this means he acquired a capacity of undertaking that grand expedition, which will render his name immortal. The first thing he proposed was a voyage into the South-seas, through the Straits of Magellan, which hitherto no Englishman had ever attempted. The project was well received at court; the queen furnished him with means; and his own fame quickly drew together a force sufficient. The fleet with which he sailed on this extraordinary undertaking, consisted only of five small vessels, compared with modern ships, and no more than 164 able men. He sailed from England, Dec. 13, 1577; on the 25th fell in with the coast of Barbary, and on the 29th with Cape Verd. March 13, he passed the equinoctial, made the coast of Brazil April 5, 1578, and entered the river de la Plata, where he lost the company of two of his | ships; but meeting them again, and taking out their provisions, he turned them adrift. May 29, he entered the port of St. Julian, where he continued two months, for the sake of laying in provisions; Aug. 20> he entered the Straits of Magellan; and Sept. 25 passed them, having then only his own ship. Nov. 25, he came to Machao, which he had appointed for a place of rendezvous, in case his ships separated: but captain Winter, his vice-admiral, having repassed the Straits, was returned to England. Thence he continued his voyage along the coasts of Chili and Peru, taking all opportunities of seizing Spanish ships, and attacking them on shore, till his crew were sated with plunder; and then coasting North-America to the height of 48 degrees, he endeavoured, but in vain, to find a passage back into our seas on that side. He landed, however, and called the country New Albion, taking possession of it in the name and for the use of queen Elizabeth; and, having careened his ship, set sail from thence Sept. 29, 1579, for the Moluccas. He is supposed to have chosen this passage round, partly to avoid being attacked by the Spaniards at a disadvantage, and partly from the lateness of the season, when dangerous storms and hurricanes were to be apprehended. 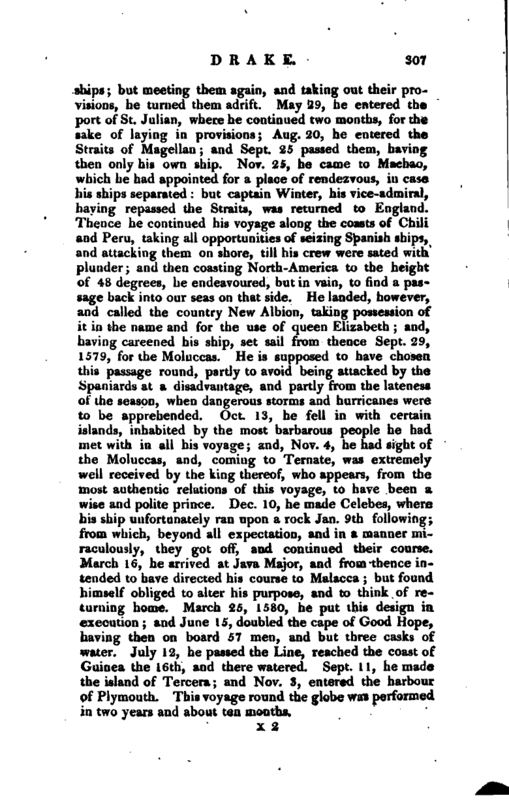 Oct. 13, he fell in with certain islands, inhabited by the most barbarous people he had met with in all his voyage; and, Nov. 4, he had sight of the Moluccas, and, coming to Ternate, was extremely well received by the king thereof, who appears, from the most authentic relations of this voyage, to have been a wise and polite prince. Dec. 10, he made Celebes, where his ship unfortunately ran upon a rock Jan. 9th following; from which, beyond all expectation, and in a manner miraculously, they got off, and continued their course. March 16, he arrived at Java Major, and from thence intended to have directed his course to Malacca; but founrf himself obliged to alter his purpose, and to think of returning home. March 25, 1580, he put this design in execution; and June 15, doubled the cape of Good Hope, having then on board 57 men, and but three casks of water. July 12, he passed the Line, reached the coast of Guinea the 16th, and there watered. Sept. 11, he made the island of Tercera; and Nov. 3, entered the harbour of Plymouth. This voyage round the globe was performed in two years and about ten months. | His success in this voyage, and the immense mass of wealth he brought home, raised much discourse throughout the kingdom; some highly commending-, and some as loudly decrying him. The former alleged, that his exploit >vas not only honourable to himself, but to his country that it would establish our reputation for maritime skill in foreign nations, and raise an useful spirit of emulation at home; and that, as to the money, our merchants having suffered much from the faithless practices of the Spaniards, there was nothing more just, than that the nation should receive the benefit of Drake’s reprisals. The other party alleged, that in fact he was no better than a pirate; that, of all others, it least became a trading nation to encourage such practices; that it was not only a direct breach of all our late treaties with Spain, but likewise of our old leagues with the house of Burgundy; and that the consequences would be much more fatal than the benefits reaped from it could be advantageous. This difference of opinion continued during the remainder of 1580, and the spring of the succeeding year; but at length justice was done to Drake’s services; for, April 4, 1581, her majesty, going to Deptford, went on board his ship; where, after dinner, she conferred on him the honour of knighthood, and declared her absolute approbation of all he had done. She likewise gave directions for the preservation of his ship, that it might remain a monument of his own and his country’s glory. 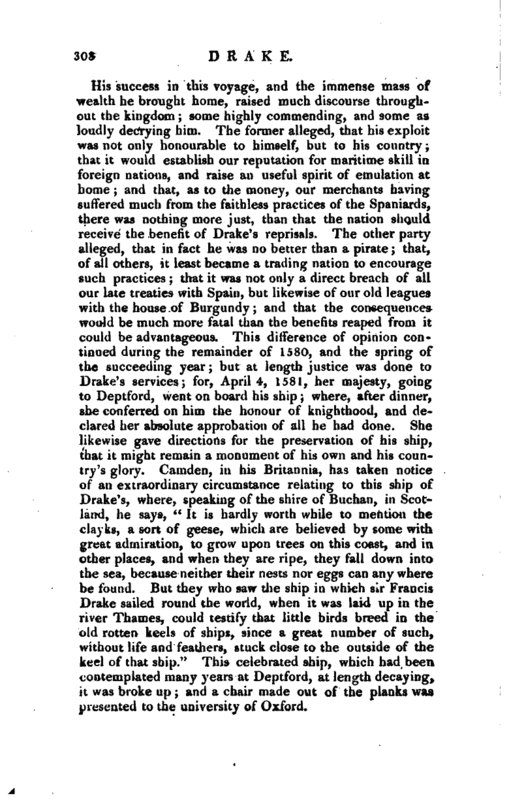 Camden, in his Britannia, has taken notice of an extraordinary circumstance relating to this ship of Drake’s, where, speaking of the shire of Buchan, in Scotland, he says, “It is hardly worth while to mention the clayks, a sort of geese, which are believed by some with great admiration, to grow upon trees on this coast, and in other places, and when they are ripe, they fall down into the sea, because neither their nests nor eggs can any where be found. But they who saw the ship in which sir Francis Drake sailed round the world, when it was laid up in the river Thames, could testify that little birds breed in the old rotten keels of ships, since a great number of such, without life and feathers, stuck close to the outside of the keel of that ship.” This celebrated ship, which had been contemplated many years at Deptford, at length decaying, it was broke p; and a chair made out of the planks was presented to the* university of Oxford. | In 1585 he sailed with a fleet to the West Indies, and took the cities of St. Jago, St. Domingo, Carthagena, and St. Augustin. In 1587 he went to Lisbon with a fleet of 30 sail; and, having intelligence of a great fleet assembled in the bay of Cadiz, which was to have made part of the armada, he with great courage entered that port, and burnt there upwards of 10,000 tons of shipping: which he afterwards merrily called, “burning the king of Spain’s beard.” In 1558, when the armada from Spain was approaching our coasts, he was appointed vice-admiral under Charles lord Howard of Efringham, high-admiral of England, where fortune favoured him as remarkably as ever: for he made prize of a very large galleon, commanded by don Pedro de Valdez, who was reputed the projector of this invasion. This affair happened in the following manner July 22, sir Francis, observing a great Spanish ship floating at a distance from both fleets, sent his pinnace to summon the commander to yield. Valdez replied, with much Spanish solemnity, that they were 450 strong, that he himself was don Pedro, and stood much upon his honour, and propounded several conditions, upon which he was willing to yield: but the vice-admiral replied, that he had no leisure to parley, but if he thought fit instantly to yield he might; if not, he should soon find that Drake was no coward. Pedro, hearing the name of Drake, immediately yielded, and with 46 of his attendants came aboard Drake’s ship. This don Pedro remained above two years his prisoner in England; and, when he was released, paid him. for his own and his captain’s liberties, a ransom of 3500l. Drake’s soldiers were well recompensed with the plunder of this ship: for they found in it 55,000 ducats of gold, which was divided among them. In 1589 he commanded as admiral of the fleet sent to restore don Antonio, king of Portugal, the command of the land-forces being given to sir John Norris: but they were hardly got to sea, before the commanders differed, and the attempt proved abortive. 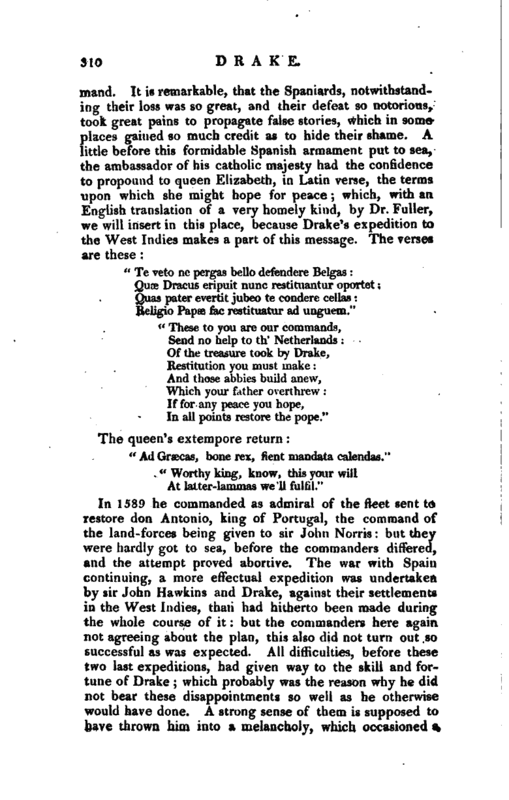 The war with Spain continuing, a more effectual expedition was undertaken by sir John Hawkins and Drake, against their settlements in the West Indies, than had hitherto been made duriug the whole course of it: but the commanders here again not agreeing about the plan, this also did not turn out so successful as was expected. 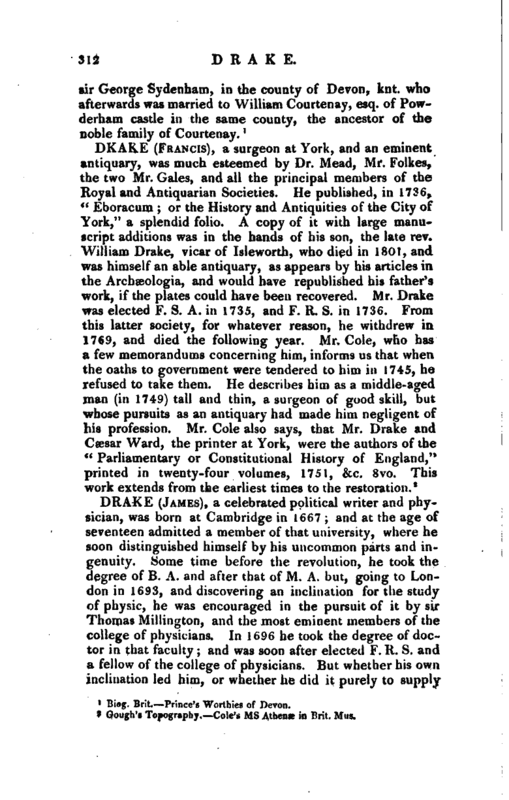 All diiriculties, before these two last expeditions, had given way to the skill and fortune of Drake; which probably was the reason why he did not bear these disappointments so well as he otherwise would have done. A strong sense of them is supposed to have thrown him into a melancholy, which occasioned a | bloody-flux; and of this he died on board his own ship, near the town of Noinbre de Dios in the West Indies, Jan. 28, 1596. 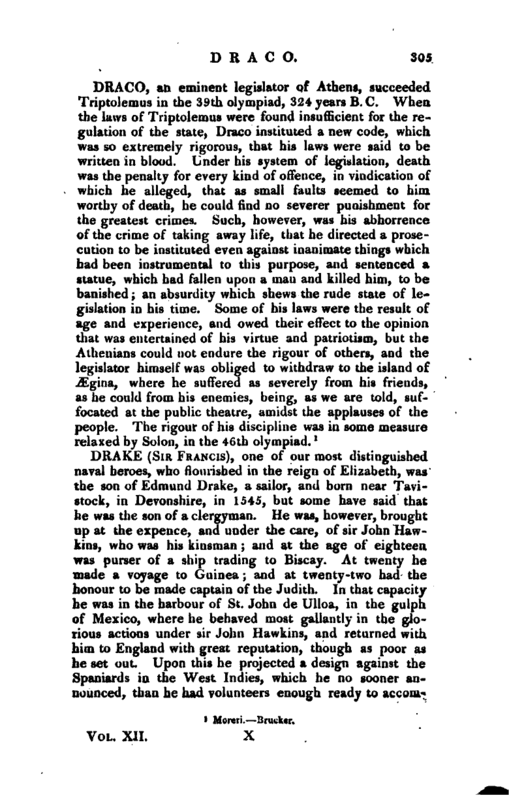 His death was lamented by the* whole nation, and particularly by his countrymen, who had great reason to love him from the circumstances of his private life, as well as to esteem him in his public character. He was’ elected burgess for Bossiney, alias Tintagal, in Cornwall, in the 27th parliament of Elizabeth; and for Plymouth in. Devonshire, in the 35th. This town had very particular obligations to him; for in 1587 he undertook to bring water into it, through the want of which, till then, it had been grievously distressed: and he performed it by conducting thither a stream from springs at eight miles distance, in a straight line: but in the manner he brought it, the course of it runs upwards of twenty miles. Biog. 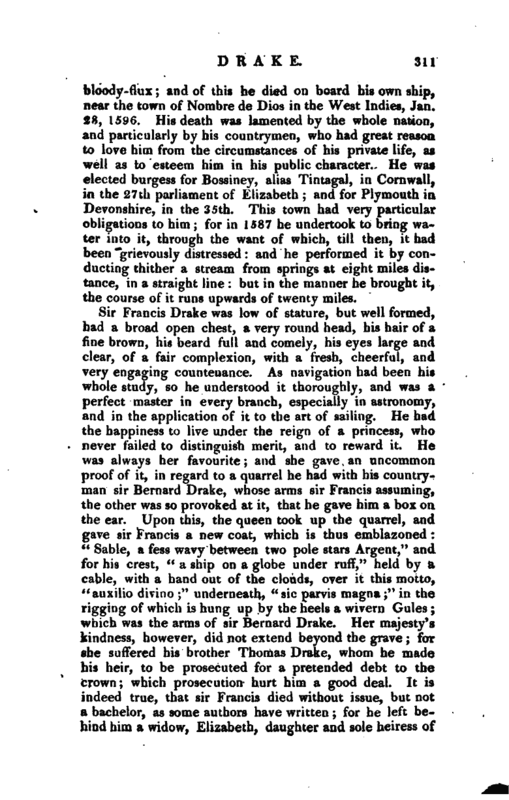 Brit.—Prince’s Worthies of Devon.